It was back to the little lake today for another go at the carp. I was hoping to use up the rest of the maggots I’d bought for Tuesday’s session, but they’d sweated up and got stinky, so I had to ditch them. Not too much of a problem, I thought, I’ll just pop into the tackle shop and get some more. Only when I got there, they didn’t have any. So instead, I picked up a pint of casters. That turned out to be a good decision. When I got to the lake, I found that a lot of it was not really fishable, due to the amount of leaves on the surface making getting a clean cast very difficult. However, I had the water to myself and the far end of the lake was clear of leaves, so I settled in there. Setting up my usual float rig, with double caster on the hook, and feeding small amounts of caster and pellets, it was a while before there was any sign of fish. Apart from a couple of “dibbbers” the float remained largely motionless for about 90 minutes, until suddenly the float disappeared rapidly, and I found myself playing a carp that was heading at great speed for a rush bed. I managed to turn it, and get things under a degree of control, but there was plenty of to-ing and fro-ing from the fish before I could net it. 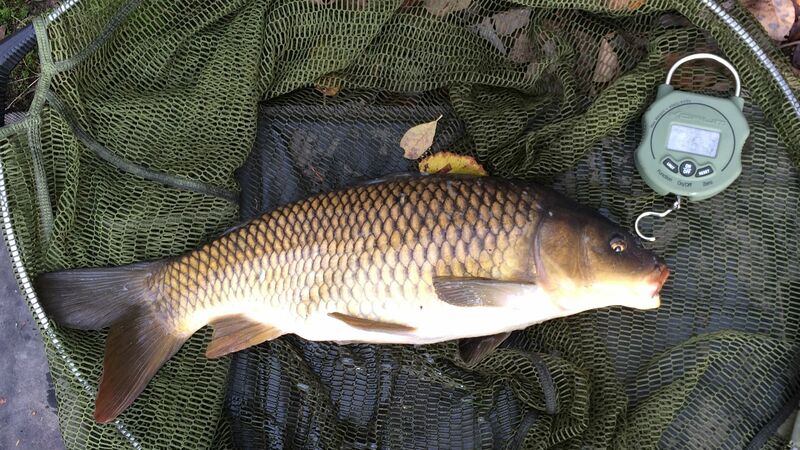 It was a lovely looking common carp of 6.03. Once the fish had been returned, I cast out again, put the rod in the rests and picked up my phone to text Andy the news, but before I had a chance to start typing, I saw the rod being yanked out of the rest. I grabbed the handle before it disappeared into the lake and found myself attached to a powerful fish. After the initial couple of rushes, I had the fish in front of me, but it was to be several arm-aching minutes before it tired enough to net it. 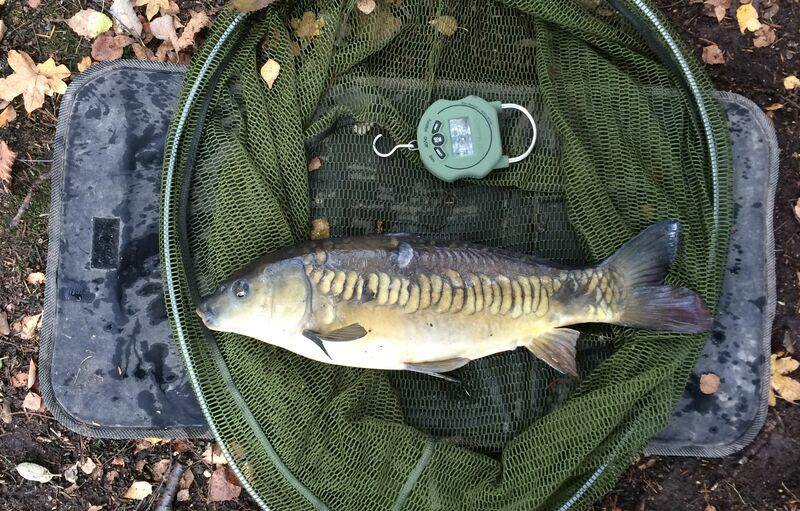 Once on the hooking mat, I thought it may be a double, but the scales settled at 9.13. I wasn’t disappointed though, as it was the biggest fish I’ve had from this venue, and a PB for a float-caught carp – actually, come to think of it, it’s the biggest fish of any species that I’ve caught on a float. Things went quiet again for the next couple of hours, when the swim suddenly burst into life. Firstly I hooked another carp, but it smashed the hooklink on its first run. Next cast, I hooked a tench, which I had on for a while, until the hook pulled out. This was followed by a bream of about two pounds, and three small rudd. There was still activity in the swim when I had to pack up as the light had faded sufficiently as to not be able to see my float. A pleasant day fishing a lake today. Wildlife was interesting. Saw a hare as I arrived at the water, haven’t seen one of those for some years. As it isn’t March, it was behaving quite sensibly. 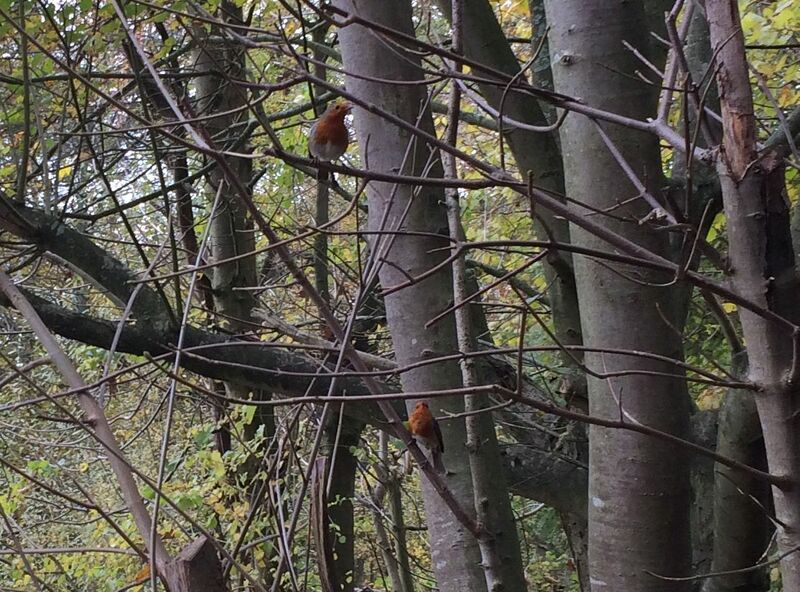 Had two robins for company during the day. 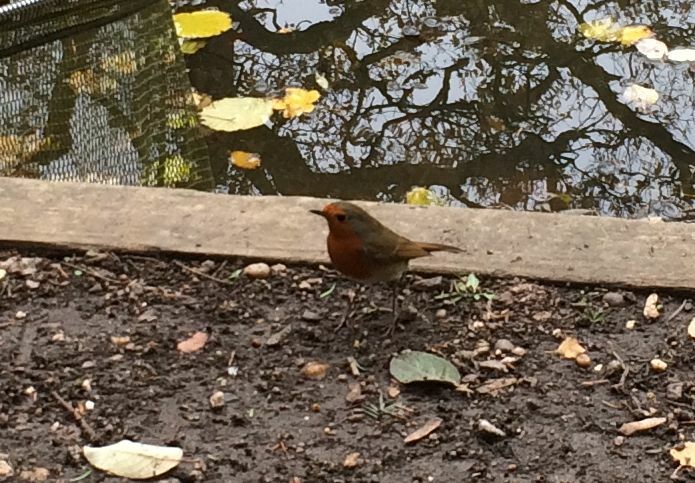 I fed them some maggots, but they were quite camera shy, though I did manage a couple of reasonable snaps. There was a kingfisher too, who seemed to be catching quite well. Not seen one of those on the venue before. Raptors were quite prominent too, with kites, buzzards and a sparrowhawk putting in appearances. I even managed to catch a few fish, starting with some small perch. Then the float shot off and a lively carp was halfway through the lily bed before I’d even reacted, and it kept going once I’d leaned into it, almost getting out the other side of the lilies before I could turn it. A steady pull got it most of the way back to my side of the lilies, but then all went solid. But the slack line trick worked, as the fish started to move again and I got it out into clear water. A few minutes later, six pounds of mirror carp was in the net. After that excitement, I had a couple more small perch, but the afternoon went rather quiet, and just three rudd fell to my maggot baits. 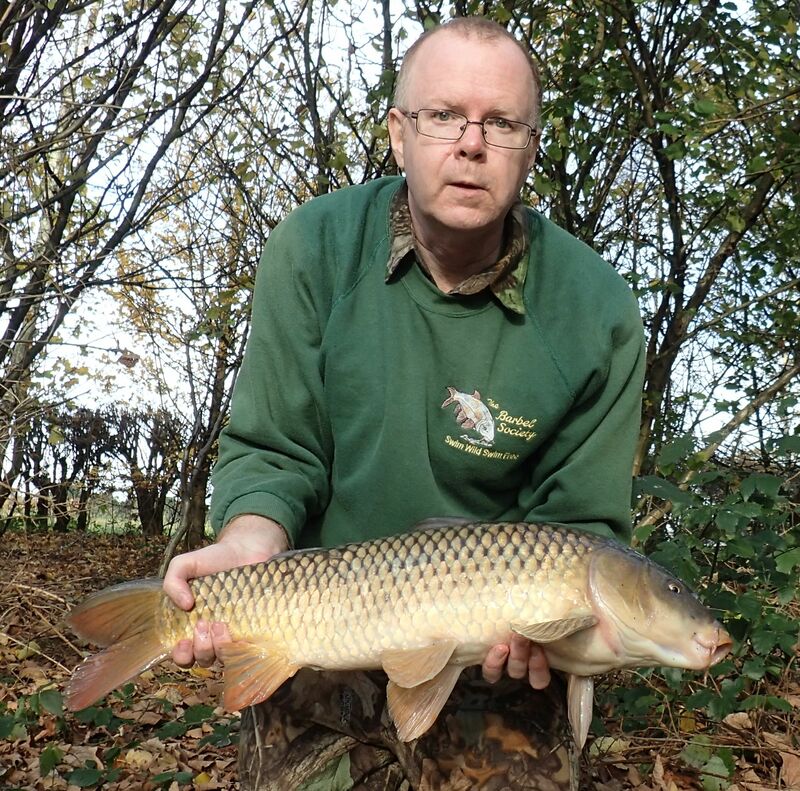 Two more sessions on the little lake this week, fished in contrasting conditions. The first was in temperatures pushing into the 30s and blazing sunshine. The second saw the thermometer showing around 10 degrees lower than the first and overcast skies. On both occasions, carp were very visible all over the lake, but looking very lethargic. 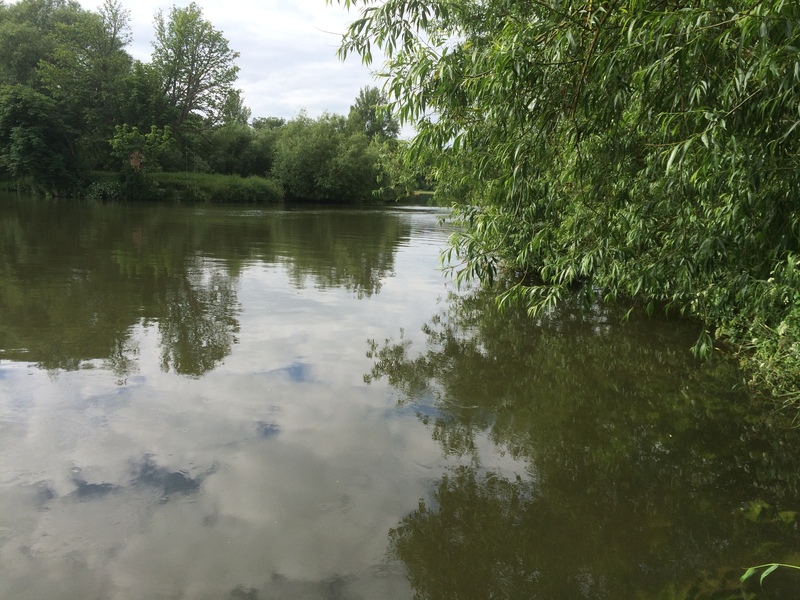 On the second visit, the swim I chose had six carp on the surface close in when I arrived. They didn’t seem to be bothered at all while I was tackling up even though they must have been aware I was there. Indeed, they didn’t even flinch while I was checking the depth of my float right in among them. But as soon as I introduced some loose feed, they melted away. 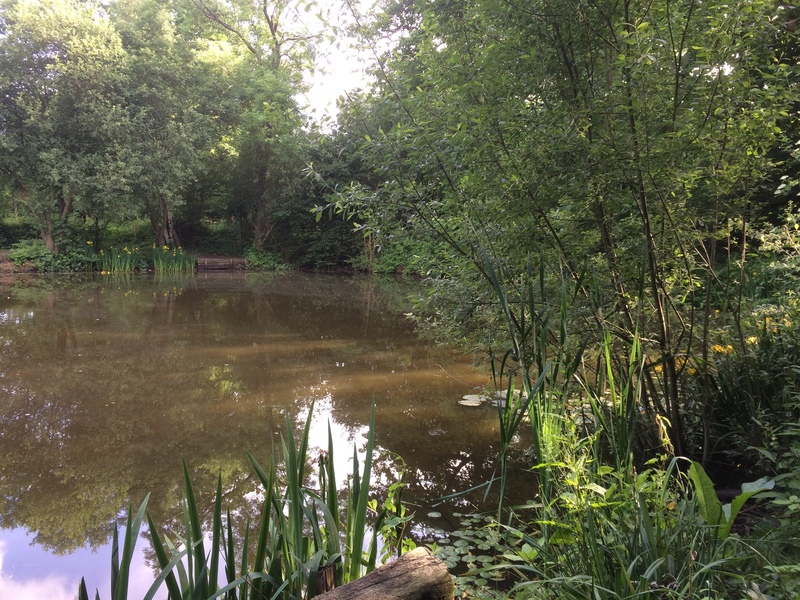 It wasn’t until late in the afternoon, both times, that the fish began to show some activity, with tench and bream fizzing at various points in the swim. I managed to land three tench on the first visit, losing another, and on the second visit, it was skimmer bream that showed, with a last-cast mini-tench to end the day – small but perfectly formed. I seem to have sorted a method that puts a few tench in the net, but it looks like I need to refine my tactics to tangle with the more elusive carp. Oh, and “Mad Mama” Moorhen was spotted seeing off a wood pigeon. Never mess with a moorhen. That was the lesson a squirrel learned today. The moorhen family on the little lake that I’ve mentioned in recent posts were over the far side of the lake. One of the parents and the chicks were on the lilies by the bank, while the other parent was up the bank. Suddenly the one on the bank went running along the path in an aggressive manner. I then realised that it was chasing a squirrel! It was certainly one of the funniest things I’ve witnessed when fishing to see the two tearing along the bank at full tilt. Unfortunately it was over too quickly to capture on camera. I didn’t see the final outcome as they disappeared into the trees, but I later saw the moorhen looking none the worse for the encounter. As for the fishing, when I arrived, the surface of the lake was covered in little rudd, and quite a few carp, which were looking very lethargic under the baking sun. I caught a few rudd and roach in the height of the afternoon heat, but it wasn’t until some shade began to creep across the water as afternoon moved towards evening that things began to liven up. The first tench of the session came at about 5 o’clock. At 2.11 it was just an ounce short of my pb (Note: I’ve not caught many tench before!). This was followed about an hour later with the smallest tench I’ve ever caught, a pristine fish of about 8 ounces. Unhooking it was fun, as it was like handling a bar of wet soap that had come to life. A further hour passed before the float shot away, heading rapidly for the nearby lily bed, succeeding in burying itself under the pads. At first I could still feel the fish, but another short surge saw it embed itself a bit deeper and all went solid. I thought that would be the end of it, but steady pressure gradually began to regain some ground and eventually the fish emerged from the lilies into clear water. Once there, things were relatively calm, although the carp continued to put up a lively resistance. A minute or two later a nice linear mirror was in the net. I’d been fishing close to the lilies throughout the session, but I’d also been baiting the other side of the swim, and after the commotion caused by the carp, I decided to give this other line a try. 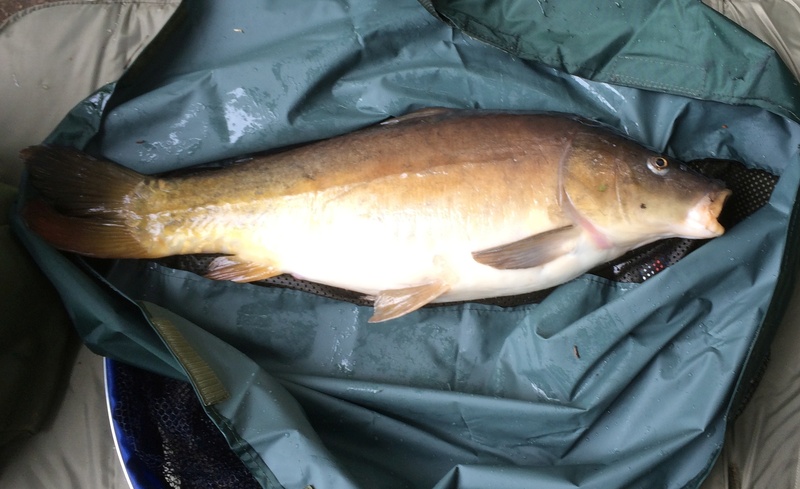 It wasn’t long before I was into the third tench of the day, a lively scrapper of about two pounds. Summer had arrived in force, with temperatures close to 30C, for the latest visit to the little lake. Luckily the swim I was in was nicely sheltered by trees, keeping direct sunlight off me, so I was relatively comfortable. But fishing was very slow compared to previous visits. I did hook a fish on my first cast which slipped the hook, but it was only a small fish, either a rudd or skimmer bream. At one point, a carp was mooching around on the top, mouthing at stuff on the surface, and it even tried to eat my float! Eventually I did get a fly-away bite that had my float heading rapidly for the lilies. I clamped down on it to stop it going any further, but the fish was too powerful and after a few seconds, the 8lb hook-length parted. Late on I switched from sweetcorn to a soft pellet on the hook, and straight away started getting bites, but they weren’t positive, and I think most likely from small fish. Despite the lack of action, the lake is a very pleasant place to be. I noticed that the moorhen chicks that I video’d last week have about doubled in size over the seven days since. Also there was entertainment to be had watching the shoals of rudd that were all over the surface, scattering every time the shadow of a bird flew across the lake. You could follow the progress as the rudd were erupting in a line along the lake as the shadow crossed them. Apart from the lack of catches, the big disappointment of the day when I arrived was to find that the padlock at the car park for the venue had not had its combination scrambled after the last person had used it. Then as I went to leave at the end of the session, the code had not been scrambled again. I don’t understand why anyone would not do this, after all it only takes a couple of seconds and a flick of a finger to turn the numbers after closing the padlock. And leaving the car park insecure could lead to all sorts of problems, not the least of which is upsetting the owners and losing the water. Another session yesterday on the small lake I’ve been fishing recently, which got off to an interesting start, when I caught a small rudd on a bare hook while checking the shotting on the float rig. It was fairly hooked in the top lip, so must have taken the hook thinking it was food of some sort. Having decided that was a one-off occurrence, sweetcorn was added to the hook when I actually started fishing. Unlike last week, there was very little visible activity from the fish, and it was at least an hour into the session before the first real bite happened. Andy had just arrived, and I’d just told him that nothing much was happening, when some bubbles appeared around my float, indicating a feeding fish was around. 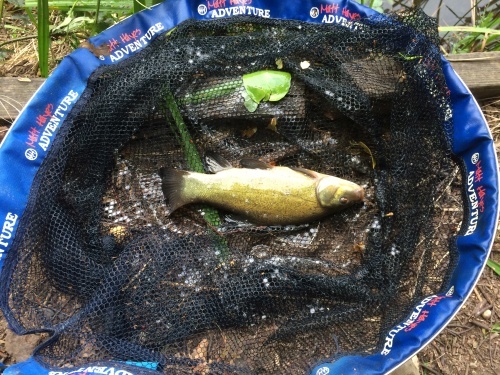 A positive bite and a lively fight soon followed, resulting in Andy netting a tench of around two pounds. A small bream followed, but it all went quiet again for a while, during which I got some footage of some very young moorhen chicks on the lilies. Andy can be spotted on the opposite bank. Switching my bait to a different part of the swim, there was a couple of slight dips of the float, before it submerged slightly and stayed under. I hit it and felt a solid resistance, but the fish didn’t seem to realise that it had been hooked for a while. I’d got it quite close in when it suddenly woke up and shot off to towards some lilies. I’d just managed to get the run under control when the hook pulled. On inspection the hook point was burred over, so I suspect the fish may have been foul-hooked. As the afternoon moved into early evening, the float sailed away and the resultant strike saw a carp tear off out towards the middle of the lake, only for the hook to pull again. This time I could be sure that the fish had been foul-hooked, as the hook had a large scale attached to it. 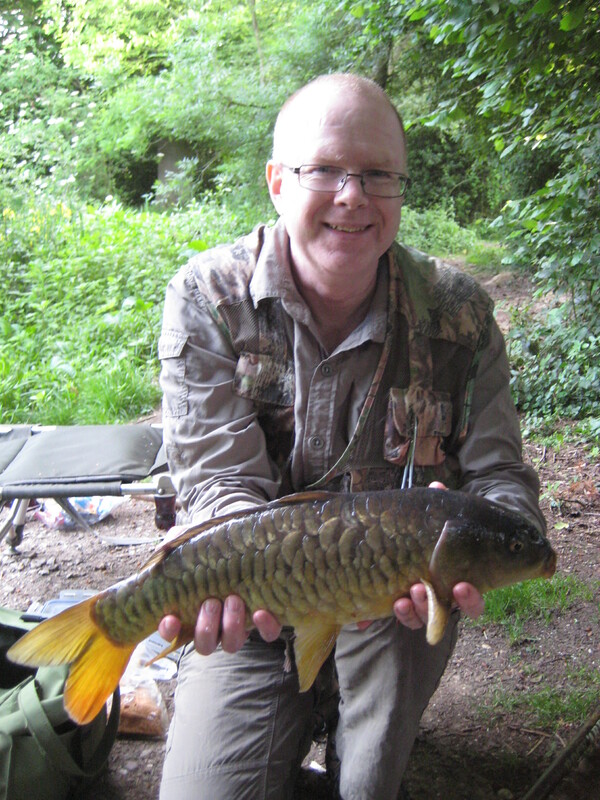 Eventually, I did managed to fairly hook and land a nice-looking common carp of about four pounds or so. 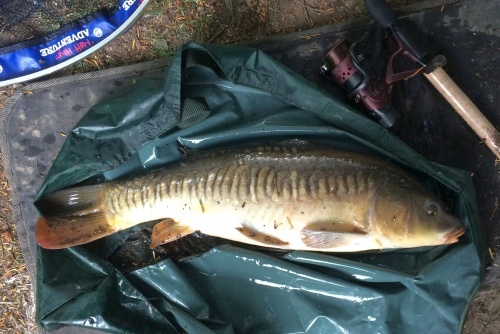 Andy had two carp, plus another seven pounder that he hooked in the tail. Odd that between us, we had three foul-hooked fish. It’s the usual fisherman’s tale of the biggun that got away. Well not really all that big, but big enough to snap a 7lb hooklink like cotton. It was a funny afternoon from the start. On arrival at the pond that I fished the previous week, I found that I’d forgotten my chair. On the off-chance, I texted my mate Andy, who had said he might be joining me later, to ask if he had a spare chair he could bring along. By an odd coincidence, he was in the area and had a chair in the car, so about 20 minutes after I’d contacted him, he turned up carrying the chair! Already, carp had started to feed around my swim, bubbling up the water. I’d started casting slightly to my right, but as a large patch of bubbles appeared by the lilies on my right, I cast my float to the patch of bubbles. Within 30 seconds, the float buried and the rod top bent round as a carp shot off towards the lilies. As I put pressure on to stop its charge, the hooklink suddenly parted. I was surprised by this, as I’d used a similar hooklink last week and was able to apply quite considerable pressure when playing a 7lb carp. Later, Andy mentioned that he’d lost a carp in a similar fashion in the same spot on a previous visit, and wondered if there was a branch or other snag that the fish went into that caused the line to part. 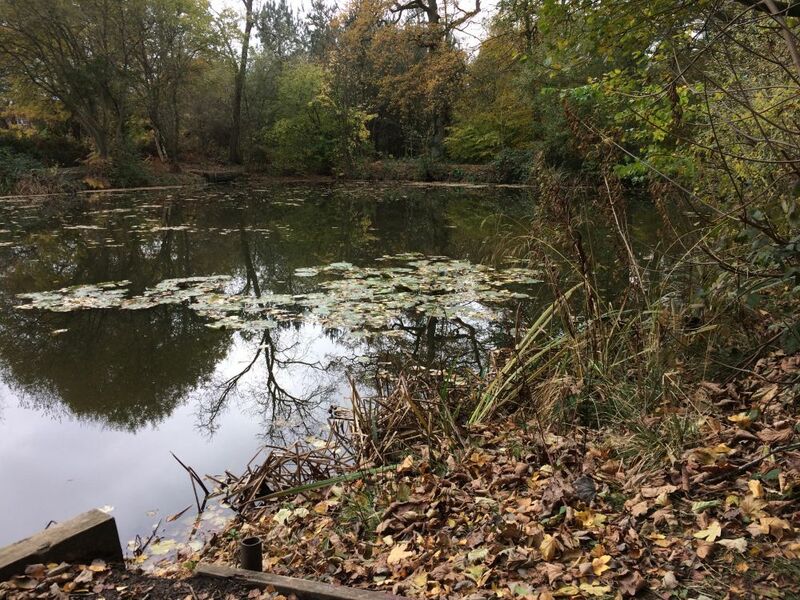 Half an hour later, another carp picked up my bait and rocketed off towards the lilies on my right, but I was able to turn it and bring into open water, where I was confident of winning the battle. I’d almost got the fish to the net, when it turned and went into the small lilies at my feet, and somehow immediately transferred the hook to a lily stem. Andy arrived later, and settled into the swim next to mine. He hadn’t been there long, when I was into another carp. The take was preceded by some bubbling a couple of yards from the float, then some bubbles a bit closer, then closer still, then the float shot away. Unlike the previous two, this one was successfully landed. It was a fully scaled mirror, weighing I suppose about four pounds. By now the sun had dropped behind the tree, and there started to be increased activity in my swim, with lots of “fizzing” going on. Most of it I think caused by tench, although there was a carp in the area too. It was obvious that the fish were rooting around for the loose feed I was putting in as the fizzing was often right around my float, but apart from an occasional bob of the float, which I suspect was caused by fish brushing the line rather than mouthing the bait, not once was there a positive bite. I had to leave early evening (and just in time to avoid a heavy shower), which was frustrating as the fish were still active in the swim. I later learned that Andy (who’d had a couple of tench from his swim), had moved to where I’d been fishing and had an eight pound carp from it. On arrival, I could see small fish topping all over the place, with the occasional carp surfacing. 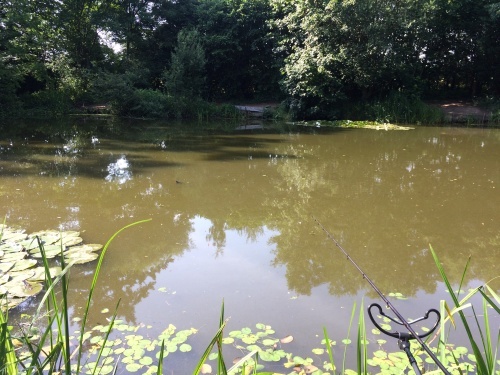 Following the guidance of my mate Andy, who’s fished it a few times, I set up in a swim with a nice lily patch to one side, fishing sweetcorn under a float, in about 3 feet of water. I didn’t have to fish too far out and a gentle cast was all that was needed to get the float in place. I was soon getting small bites, most of which I missed, but did eventually hook a skimmer bream. Another soon followed. Then I had two “sail-away” bites in quick succession which I somehow didn’t connect with. A third bite followed, and this time I did connect with a small but very lively tench that may have gone two pounds on a good day. I was very pleased with this, as it’s the first tench I’ve caught in around twenty years (not that I’ve fished for them much in that time). 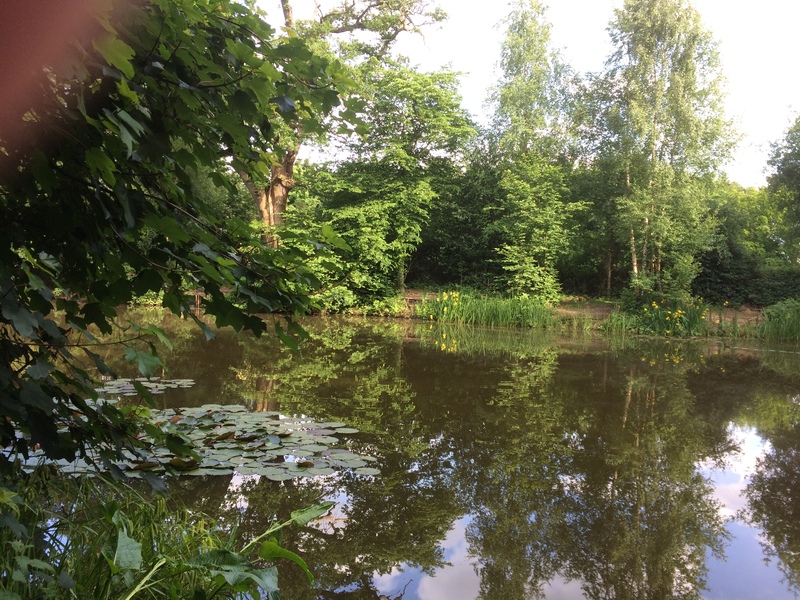 By now, there were a least three carp active in the margins of my swim, two of them right at my feet, bumping the lilies about. But getting them to take a bait was not easy. I’d started fishing more or less off the rod-top to see if I could get one, but the first bite I hooked was a small rudd. 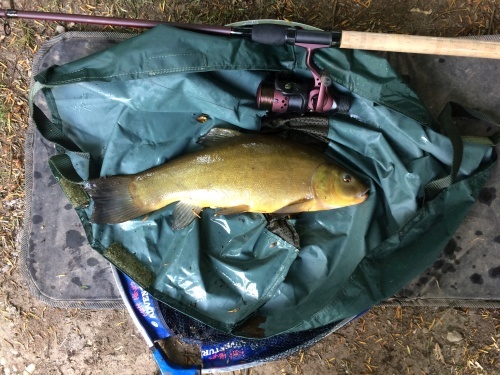 It may not have been the intended target, but it was still very welcome, as – like the tench – it had been many years since I’d last caught one, and they are a beautiful fish. 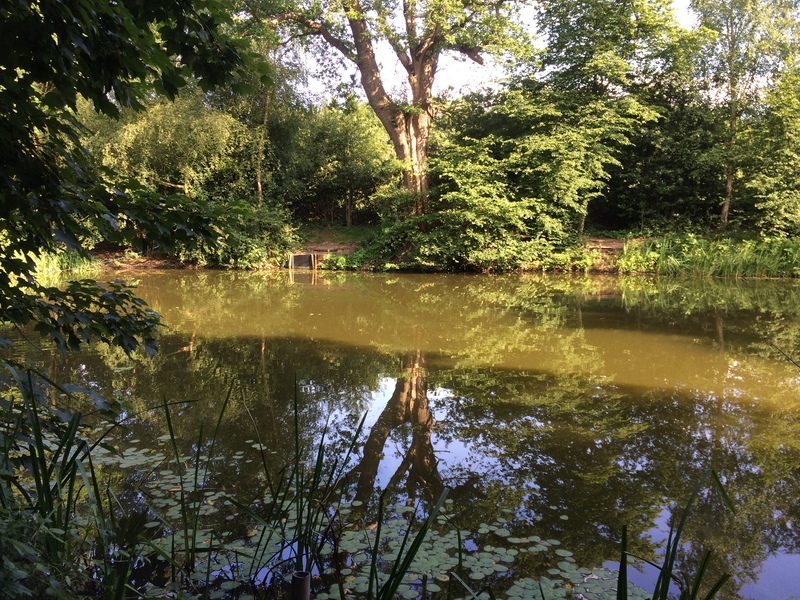 A few minutes after returning the rudd, the float suddenly shot away with the speed of an express train, and I found myself attached to a carp, which had buried itself in the lilies before I had a chance to do anything about it. However, with steady pressure, I was able to gradually pull it back out into open water. A lively fight followed, and although the fish didn’t take any line off the clutch, it was dashing back and forth, and it took me several minutes to net it. A quick weigh showed it to go 7.04. The commotion created while landing the fish caused the swim to go quiet for a while, although a carp did eventually start rooting around again in the lilies at my feet. All I managed to catch after that was a small roach-bream hybrid. But that was six fish with five different species in the afternoon, so I was well pleased with my efforts. Needless to say (as someone once said) I’ll be back. 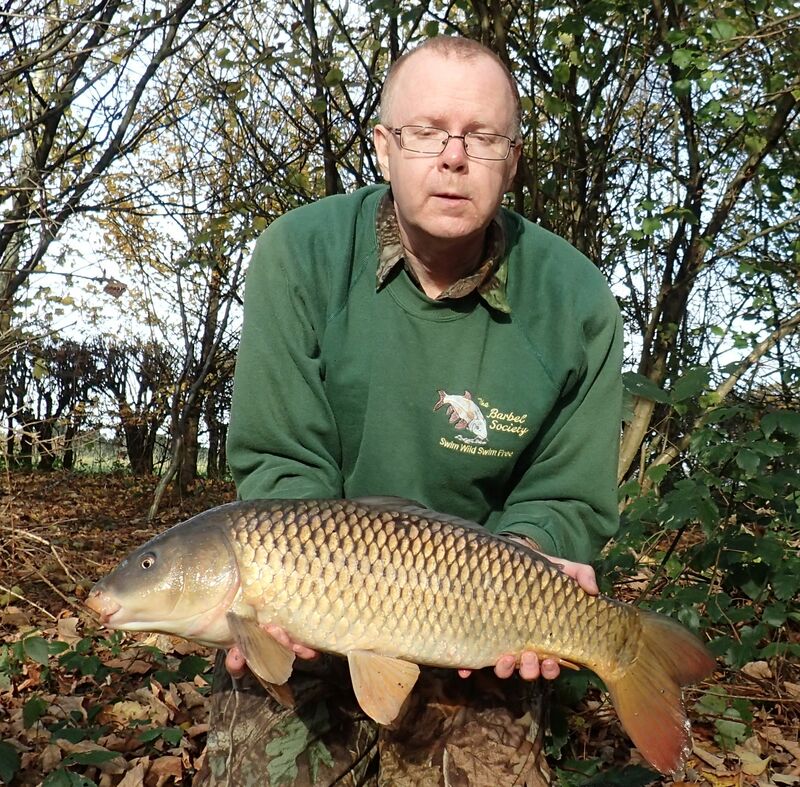 Andy had turned up not long after I’d had the carp, and he set up in the adjoining swim. I had to leave around 7 o’clock, but I later heard that he’d had four tench and 2 carp, so he also had a short but productive session. 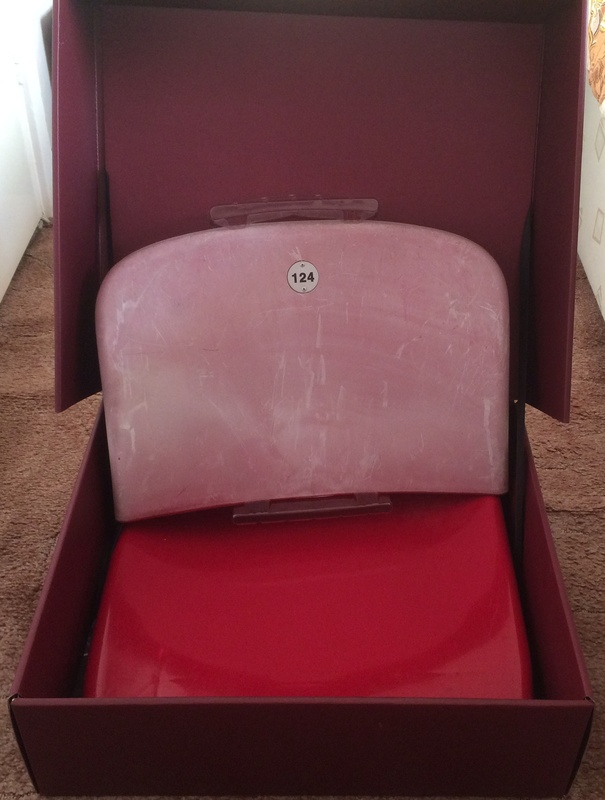 I went back to the Boleyn Ground for one last time today, to collect my seat – the seat that I’d sat in for every home game since August 2002 (bar a couple of missed matches). On the way, I stopped off at Stratford to make my first excursion into the Olympic Park. At a moderately brisk walking pace, it took me 15 minutes to get from Stratford station to the stadium. I would think it will take considerably longer to do the return journey on match days, with 60K fans all leaving at the same time. Unfortunately, you can’t get right up to the stadium at the moment, although you can get quite close. West Ham’s new stadium store is open, so I popped in for a look round. It’s definitely an improvement on the old portakabin of years gone by! The Lyall Gates, moved from the main entrance of the Boleyn Ground, are now installed inside the store, and I have to say they do look good in there. There were a few items I was tempted by, mostly the retro gear, but managed to restrain myself and kept my credit card firmly in my pocket. All the new stuff now has the new crest design on it, which looks better in “real life” than it does in the on-line images I’ve seen, but I still don’t like the word “London” being used in it. 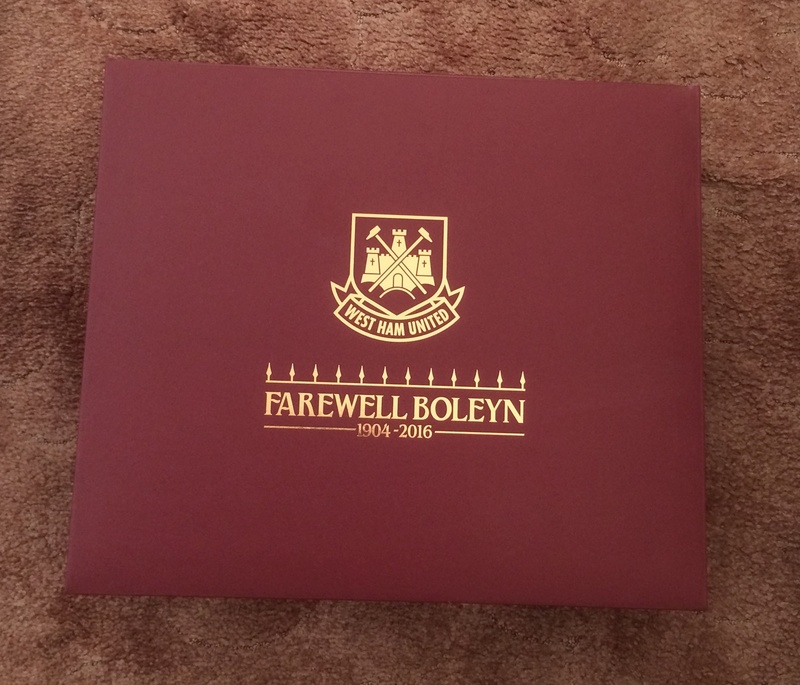 So then it was off to the Boleyn Ground to collect my seat. That was a straightforward operation (unusual for West Ham!). It was a bit sad to see the old girl starting to look a bit run-down, with various bits having been removed. Amongst other things, the crests on the West Stand towers have gone. I also saw a double mattress being removed, which made me wonder what the Daves and Karren had been up to, but I guess it must have come from the hotel. 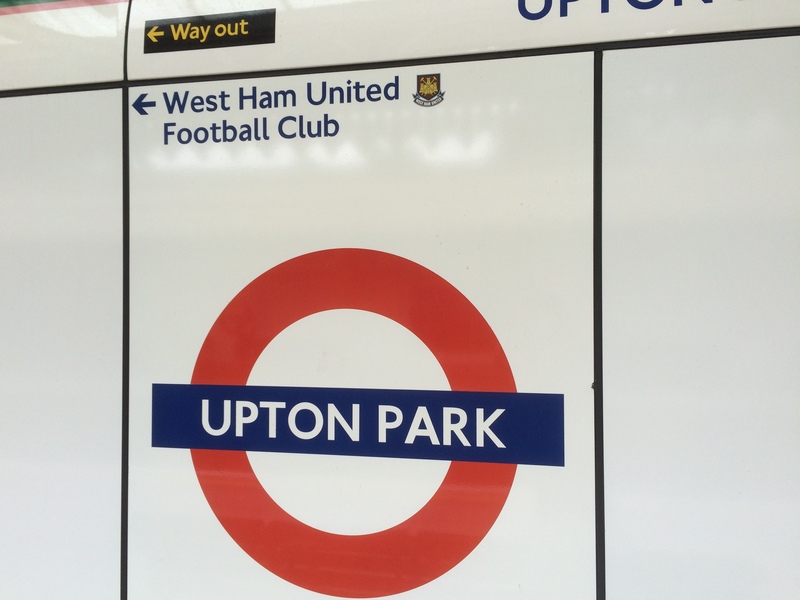 Then off home, going home from Upton Park station – the first time (and now the last time) that I’ve used that station for the homeward journey for many, many years, as I always used to walk to either Plaistow or East Ham after games. A frivolous purchase, I suppose, I’m not even sure what I’m going to do with it, but hey! I’d paid a few thousand pounds to sit it in for fourteen seasons, so another pony on top doesn’t seem to be too much 🙂 The back is rather faded, but the seat is still a nice shade of claret.